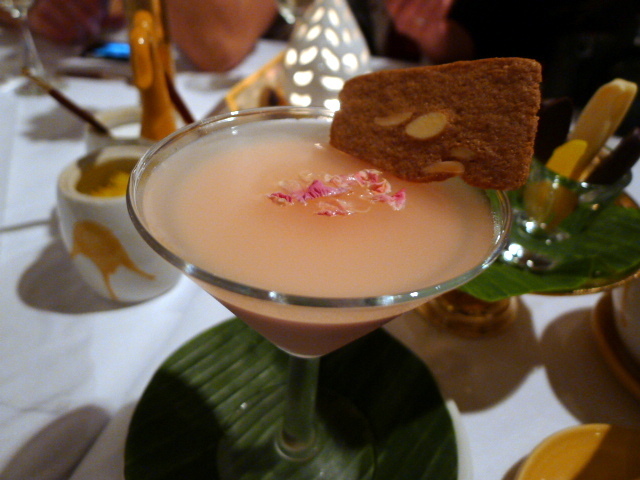 La Portes Indes is an Indian restaurant with a difference. Opened in 1996, the food contains a Gallic twist and is inspired by the dishes of Pondicherry, an area in India that was formerly a French colony. Being a Franco-Indian restaurant it is possible to find dishes such as cassoulet de fruits de mer on the menu. The restaurant occupies an incredibly grand space. Set over two floors, La Portes Indes has a look of the exotic to it, with a 40ft Mogul waterfall, a marble staircase and antique Indian artifacts. The menu is plentiful with options. We started with a tandoori seared foie gras (£13.00) which was rich and unctuous. 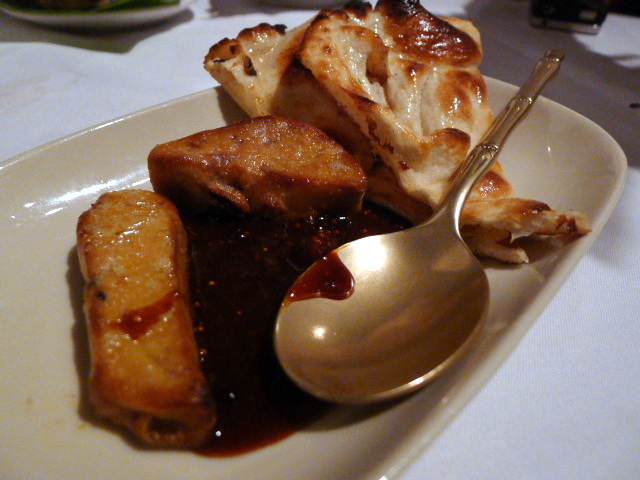 It was pleasantly sweetened by a fig and ginger chutney that matched the foie gras well. 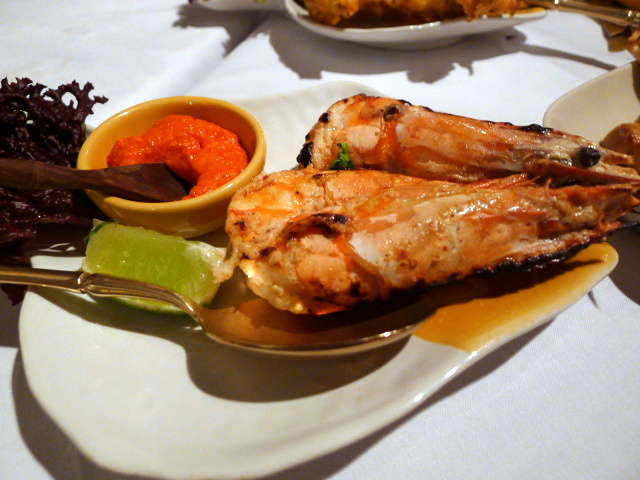 Rubiyan Jhinga (£12.00), tandoori wild tiger prawns was accompanied by a yummy hot red chilli sauce. 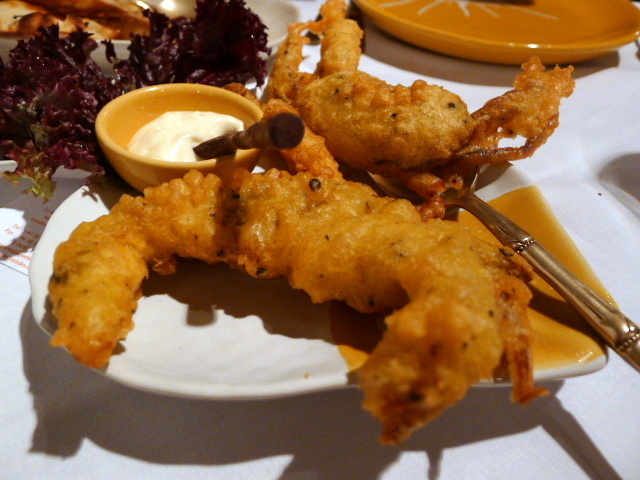 The prawns were decadently meaty, fresh and tasty. The crabs in a starter of deep fried soft shell crabs (£12.00) were sweet, although the batter was too thick and a little too oily and had the effect of drowning out the flavour of the crab. 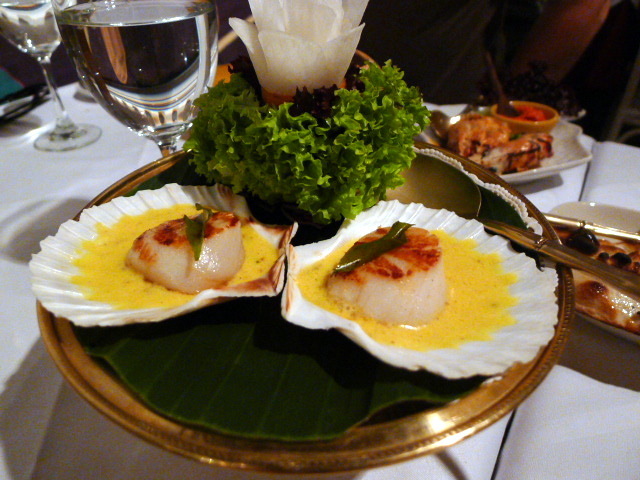 Demoiselles de Pondichéry (£12.00), grilled king scallops with a garlic and saffron sauce were firm and sweet. The sauce was tastefully done and was a good pairing for the scallops. 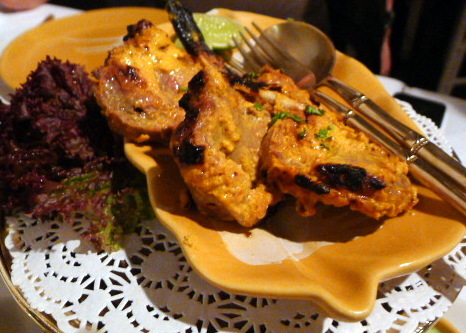 To mains, and tandoori lamb chops (£19.00) accompanied by a mint chutney was tender, moist and gamey. However, the lamb chops had a slightly powdery finish from the marinade. There was a range of house ‘Thalis’, each of which included a selection of dishes from the à la carte menu. 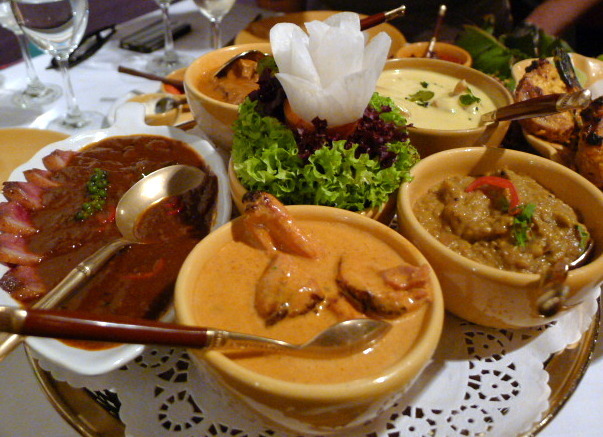 The plateau des Indes (£25.00) included prawns with turmeric, chillies and ginger (crevettes assadh) and a goat curry with coconut milk (kari de mutton). There were also duck breast fillets with a tamarind sauce (magret de canard pulivaar) and chicken braised with tomatoes and spices (dhaba murgh). The prawn and goat dishes were both pleasant and creamy but lacked for some imaginative and heartfelt spicing. The duck was a touch chewy although the tamarind sauce was agreeably zingy. The chicken was a letdown and proved to be dry. 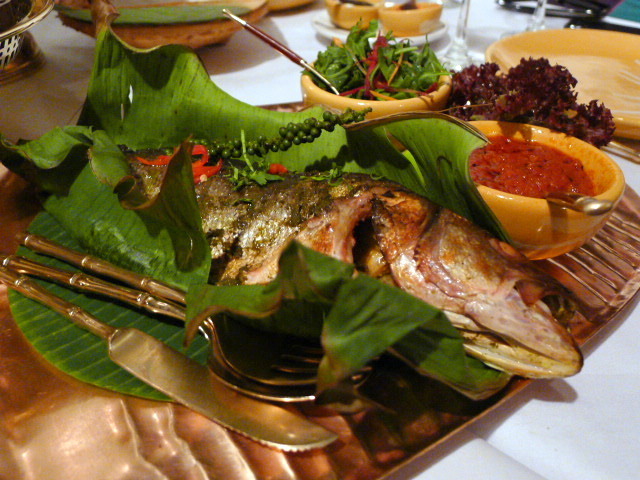 Policha meen (£25) grilled sea bass marinated with green pepper, garlic and shallots and served in banana leaves was not quite the specialty dish that the house promised. The dish lacked the ‘wow’ factor with the fish tasting dull. There was also very little excitement or aroma in the marinade to lift it. 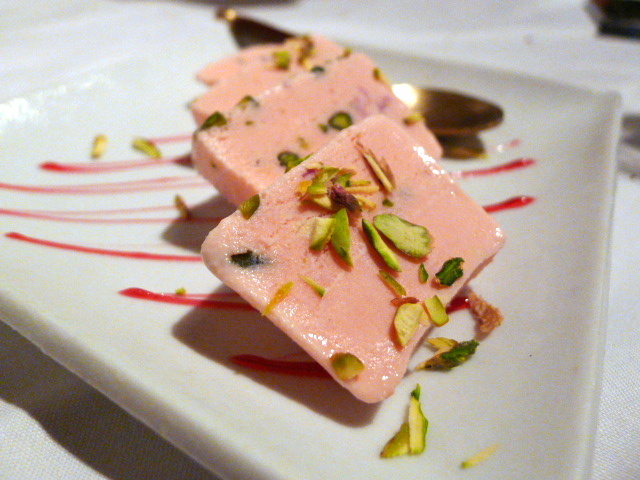 Rose and pistachio kulfi (£8.00) was yummy and creamy but the winning dessert was the excellent lychee and wild rose panna cotta (£7.50) with the rose providing an enlightened perfume to the dessert. The starters and desserts were distinctively enjoyable, although the assiette and the fish did not quite hit the same high notes. The food was tasty, but it didn’t quite have that distinctive spicing that one might associate with the most authentic of Indian, even if it was Franco-Indian. Nevertheless, this was a pleasant, tasty meal with the experience elevated by the warm and genuine charm of both the service and the décor. Price range: About £31 – £46 per head. Excludes drinks and service.